Understanding how new species form, a process termed “speciation,” is a central question in biology. Scientists typically study speciation with respect to how populations of a single species diverge to form two distinct species. However, Glen R. Hood, a doctoral researcher in the lab of Jeffrey Feder, a professor in the University of Notre Dame’s Department of Biological Sciences, notes that speciation may not be an isolated process, as the origin of one species could open up new niche opportunities for associated organisms in higher levels of the food chain, leading to the sequential origin of many other new species. 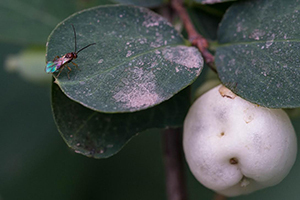 In a new paper, Hood and colleagues from Rice University, the University of Iowa and Michigan State University show that this is true for three species of parasitic wasps attacking Rhagoletis fruit flies, including the apple-infesting host race of R. pomonella formed from hawthorn flies within the last 160 years. Previous research in the Feder lab had documented both genetic signatures of, and the ecological mechanisms promoting, sequential divergence of one wasp species (Diachasma alloeum) attacking Rhagoletis fruit flies. However, Hood wanted to know the frequency at which these sequential divergence events occurred in this system. In other words, how many new species would form in this manner? He began the project back in 2009 when he first joined the Feder lab as a doctoral student. Now, six years later, he finally has the answer: Sequential divergence not just linearly, but multiplicatively, amplifies biodiversity across the food chain for three different wasp species in the parasite community. The new research has the potential to impact our understanding of evolution. Typically studies of the relationship between ecology and speciation are “one-dimensional within ecosystems,” Hood says. "The focus of attention is largely on how genetic and phenotypic variation within a population is transformed by natural selection to create genetic and/or phenotypic differences between species. The consequences of natural selection are therefore usually confined to their effects within a single species. As a result, we now have a good understanding of how natural selection can generate new species. “However, environmental adaptation also has potential repercussions for the radiation of entire communities,” Hood says. “Although conditions might not always be optimal for such cascading divergence to occur, the study is the first to confirm its multiplicative action in nature,” Feder adds. “Thus, even if not overly common, sequential divergence still has the potential to make an important contribution to the genesis of biodiversity and could help to explain things such as the restoration of organismal diversity following mass extinctions. The study can be found here: www.pnas.org/content/112/44/E5980.abstract. Originally published by William G. Gilroy at news.nd.edu on November 12, 2015.